Published Jun 5, 2017 By Julia 4 CommentsThis post may contain affiliate links. This carrot smoothie is a healthy and filling breakfast, packed with fruits such as pineapples, bananas, mangoes, and strawberries. This carrot smoothie has the word tropical written all over it. Just look at all of the fruits — mangoes, pineapples, bananas — and that bright orange color. 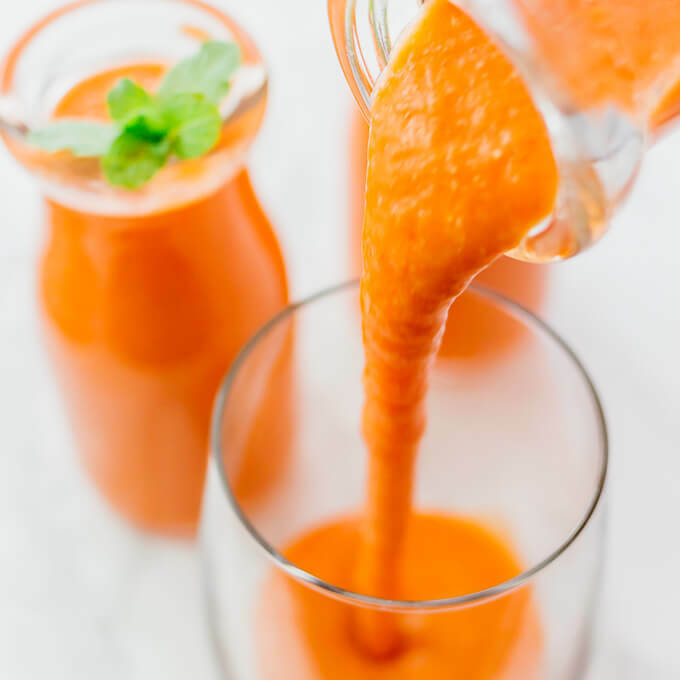 It’s a really refreshing drink, not to mention healthy, with one cup of carrots per serving that provides over 400% of your daily recommended Vitamin A. 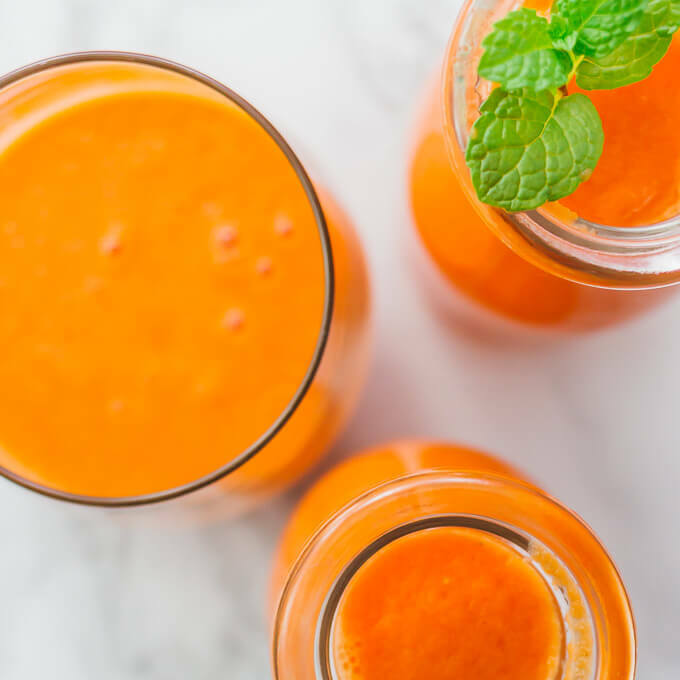 This carrot smoothie is a fast breakfast-on-the-go option as well as an energizing pre-workout drink. 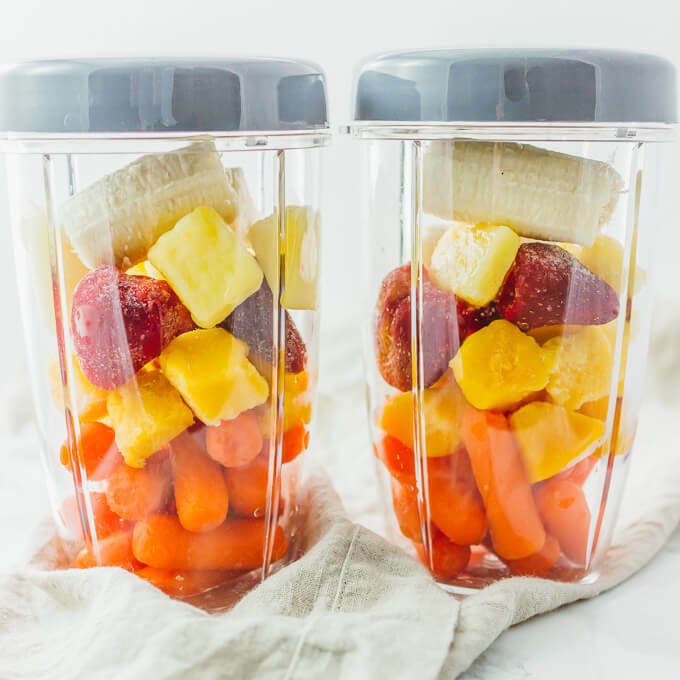 Mr. Savory Tooth and I have been drinking this carrot smoothie first thing in the morning for years now, and we’re so fanatical about it that we even lug along our Nutribullet blender on road trips so that we don’t skip any days. Last year when we went overseas, we were really bummed that we couldn’t bring our blender; we were unable to find a suitable voltage converter that could handle our blender’s power requirements. My mornings are pretty hectic, but whose isn’t? Consequently, I never actually assemble these smoothies in the morning. Instead, I assemble each smoothie’s proportion of ingredients the night before in the blender cup, cover, and refrigerate. In the morning, all I do is add a few tablespoons of oats plus water and blend away. It makes my mornings ridiculously fast. I recently bought more Nutribullet blender cups so that I could assemble three days’ worth of smoothies at a time. The other good thing about making these smoothies the night before is that it gives the frozen fruit time to defrost. This makes it much easier to blend these ingredients into a smooth drink, especially if you don’t have a powerful blender. This carrot smoothie idea came to me on a whim when I was thinking about ways to increase carrot intake in my diet. Before that, I was drinking green smoothies every day. In my opinion, carrot smoothies taste, look, and smell better. Carrots are also easier to work with, as they last a lot longer and are less messy compared to greens like kale and spinach. This carrot smoothie is a healthy and filling breakfast, packed with pineapples, bananas, mangoes, and strawberries. 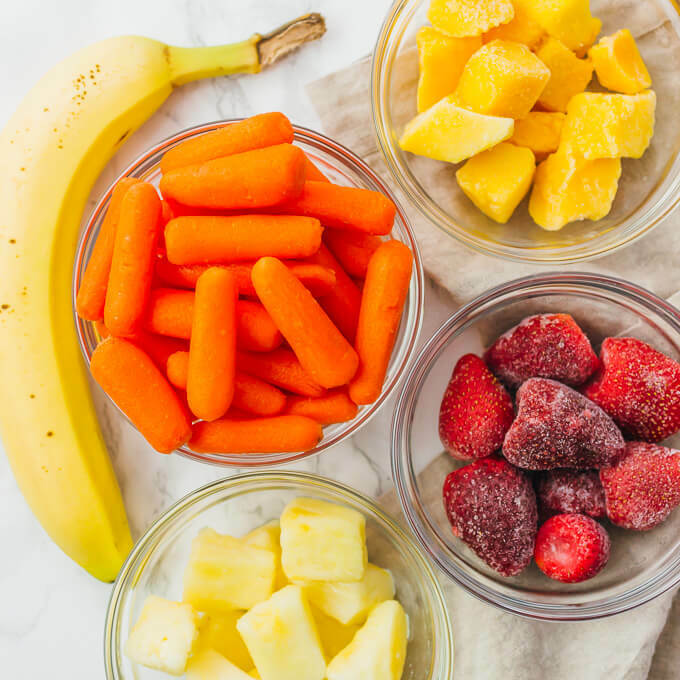 Add all ingredients to the blender container. If using Nutribullet or other personal blender, divide ingredients evenly among 2 blender cups. Blend until smooth. If too thick, add more water until the consistency is to your liking. Optionally, garnish with fresh mint leaves and top with additional oats. Just made this and 10 ounces of carrots is a lot more than 2 cups. The carrot taste is overpowering so next time I’ll put less so I can taste the fruits. Love the color too! The recipe states baby carrots… sounds like you used regular carrots and that’s why it was more than 2 cups? If the carrot taste is too strong for you, definitely add less next time and/or add more fruit. Hope you give it a try again! I love the fun orange color! Something different than the typical green. I definitely need to make it for my kids!